Would you believe I’ve thought about and prayed for you all this week, even though you didn’t hear from me? It’s true. I’ve composed and re-composed five or six different blog posts that all ended up in the round file. All because they didn’t seem good enough. Predictably ironic, as that is precisely the topic I want to share about today. So – this might be the craziest blog post you ever did read, because I’m setting a timer for forty-five minutes and posting at the end of it, come what may. Goodness gracious! Even though it’s not Christmas time, I’d like to share a story that happened around Christmas a long time ago, because it illustrates the frustration of never feeling like enough. It was a defining moment of my childhood. I was about six years old when I realized I couldn’t save the world. Or at least not the kids Christmas choir. About two dozen uninterested kids dragged to practice by dutiful parents surrounded me on stage. Kids ranging in age from kindergarten to sixth grade sang Arch the Angel for our church Christmas concert. I was an earnest, conscientious kid who loved to sing. The choir director instructed us to sing louder, so I sang louder. Not more than a minute later, she repeated herself. I was perturbed, but always one to please, I belted out “Arch the Aaaaangel, whaaaaaat a guy…” as loudly as could still be considered singing. The choir director stopped the song abruptly, shamed us for not following her directions, and made a production insisting we sing louder. I held back tears. I screamed myself hoarse that evening, leaving my voice on the stage of that church and returned home a different kid. I learned my all wasn’t enough and maybe I wasn’t either. Fast forward to the present. 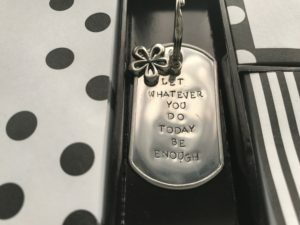 “Let whatever you do today be enough.” It’s a saying engraved into a silver key chain given to me by a dear friend who knows I struggle with perfectionism. It decorates my desk with a visible reminder that my identity and actions are two separate issues. As to my identity, God adopted me into his family as a beloved daughter in whom he takes unending delight. And as to my actions, God is not a hard master. But what does that even mean and what gives me permission to believe it? After all, the saying isn’t a Bible verse. When my awkward attempts to show love by fitting into the agenda of others doesn’t seem to bear useful fruit and I’m haunted, yet again, by the question, “Did I do enough?” what then? At what point does the love I’m trying to show become enough? Is it ever? I once saw a silent skit on a Beth Moore simulcast. A mother started the day with a basket full of peaches and a big smile. She sent her husband and daughter both off with a kiss and a peach from her basket. The she pantomimed a phone call and gave another peach away. She knocked on a door and stood peach outstretched with a friendly smile. The neighbor at the door angrily grabbed the fruit, hurled it to the ground, and slammed the door. The mother returned home looking shaken but brightened when her son walked through the door. She held out a peach to her son. But the son spun away and the peach thudded. One by one, each interaction emptied a peach from the mother’s basket until none remained. The mother curled into a fetal position, looking as forlorn and bruised as many of the peaches. Then a man entered dressed in white with a purple sash. He retrieved all the abandoned peaches, one by one, and gently placed them into his basket while the woman watched, astounded. The man helped the woman to her feet and wiped away her tears. None of her efforts were wasted. 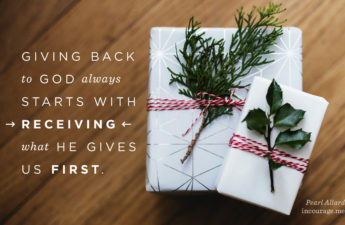 They’d all been gifts to God, regardless of how they’d been humanly received. 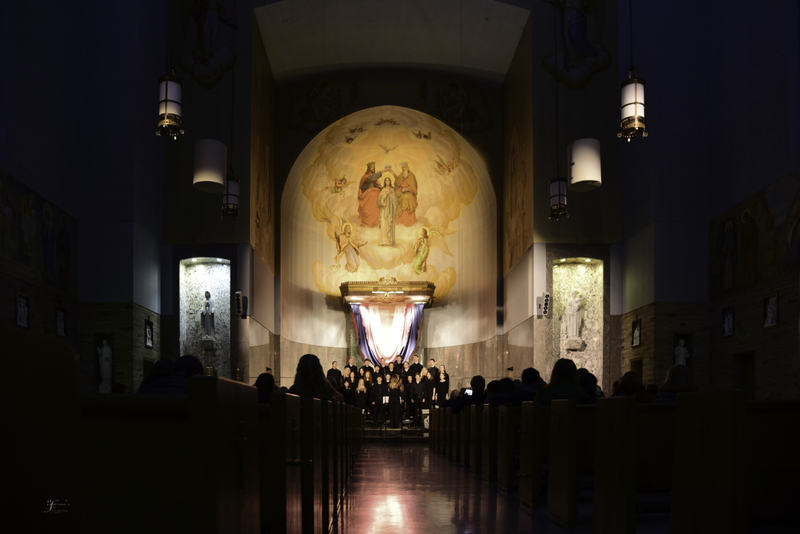 I couldn’t sing loudly enough, at six years old, to make up for a whole choir of kids, that were nearly all older than I was, not pulling their weight. But that didn’t mean I wasn’t enough or not doing enough. One person can’t be a choir. I can only live my life and be the best drop in the bucket I can be. The world constantly screams, “Sing louder!” But screaming doesn’t make the song beautiful. Singing for Jesus is what makes the song beautiful. Sometimes, after all the agony of soul-searching, I have to concede that the screaming only drowns out God’s still small voice, and I’m not the problem. I simply need to keep on being part of the solution to the capacity I’m able and let that be enough. God sees and knows every effort I expend, every sacrifice I make, and will reward it as he sees fit. Oh! That brings tears to my eyes! Thank you for sharing this, Pearl! It wasn’t crazy at all. It was perfect for the moment! Hugs, dear Melissa! Grateful it touched you. Those defining moments in life… Thank God, He is always enough and makes us enough, too. Pearl, I’m a recovering perfectionist and knowing that my gifts given for God’s glory will never be wasted…just a balm. Thank you, thank you for this post. Glenda, so glad it encouraged! We’ll keep reminding each other! In particular, I liked your statement: One person cannot be a choir. The struggle is real, isn’t it? Debbie, thank you for your encouraging words. I’m grateful if God met you where you’re at through this. Hugs! Oh perfectionism, how well I know this foe. I read somewhere, if you’re a perfectionist, aim to do a C, because your C is most people’s A+. Beautiful post. Thanks for writing it! Diane, that advice is so practical. Love it! Removing a heavy weight so our little engines that couldn’t, now can! Thank you for your kind words. “Singing for Jesus is what makes a song beautiful.” Love it, Pearl. Will be singing my song for Jesus today — and for me my “singing” includes homeschooling my kiddo and seeing my hubby off to the train station. Thank you Pearl, sometimes I feel like I am going in circles and there is no one to help me stop. Thank you for again reminding me that God knows my heart, that what I do for him, is always enough 🙂 God knows when we need that pep talk and sends us friends, family, church and strangers sometimes to show us he knows 🙂 Thank you for listening to him so that sometimes you can help us to listen a little closer! Polly, I understand that circle business. Not a fun place to be. I’m grateful with you for those He places in our path to help us break out of that cycle and move forward together! So glad God encouraged you through this post! Hugs! This is just the post I needed to read. I’m sorry about all those others that didn’t turn out – I’ve had something similar happen myself-but I’m also grateful God led you to write this one. As a perfectionist, too, I also took an elementary school teacher’s frustration with my class personally once, and I still have trouble saying, “I did what I was called to do and that is enough.” Thanks for the reminder that it is not about perfection or trying to be the whole choir. Emily, your words are like a heart hug! Your posts have been an encouragement to me (http://www.emilyconradauthor.com); it’s an honor to encourage in return! But I’m sorry you’ve had to deal with a similar situation. It’s not easy to hear quiet truth and keep it close. As to the round-filed posts, you are so sweet to even mention them! But why should it be easy? God knew the struggle I needed so I’d be reminded it’s always, ever, only Him. His grace, his love, his truth freeing me from myself. Thanks Riley! Praying you are as gentle to yourself as you’d be to someone else. Hugs! Oh, this says it all. Thank you so much for hitting “Publish!” I needed this. “The world constantly screams, ‘Sing louder!’ But screaming doesn’t make the song beautiful. Singing for Jesus is what makes the song beautiful.” Amen! Rebekah, I needed this too. Perfectionism only breeds “page fright” – love the phrase you used! 🙂 Glad we are not alone and can remind each other of truth.